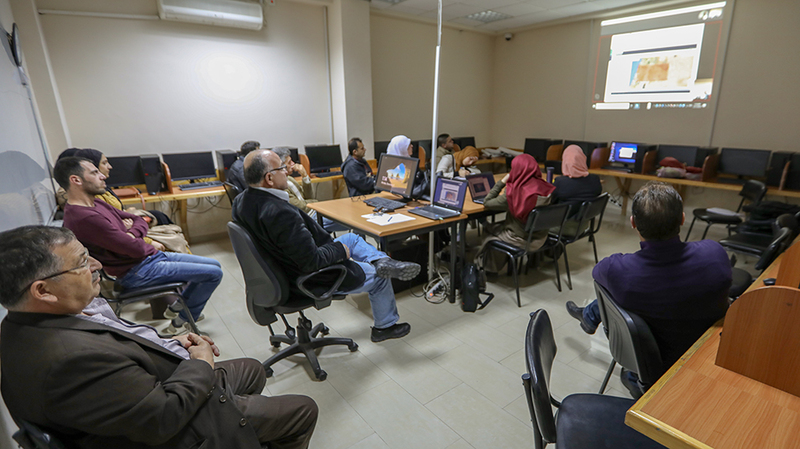 Wahib Sahwan, a professor of geography at the Friedrich-Alexander-University of Erlangen-Nürnberg, gave a lecture, via video conference, on geographic data acquisition and analysis, on Monday, December 17, 2018. In the lecture, entitled “Satellite Imagery & Earth Observation: The Challenge of Big Data,” Sahwan detailed the types of satellites from which geographers source data on vegetation and climate change across vast areas, such as the polar orbit and geostationary satellites. The primary satellites used in earth observation were launched and are maintained by three distinct parties: the U.S., the European Union, and Japan, Sahwan said, noting that each of these satellites focuses on a different region and has a specific use. Of these satellites, Sahwan discussed the Moderate Resolution Imaging Spectroradiometer (MODIS), launched and operated by NASA. Data from MODIS, with its low spatial resolution and high temporal resolution, can be used to monitor changes in the landscape over time, noted Sahwan, who added that students can access data from MODIS by visiting the United States Geological Survey’s EarthExplorer website. Sahwan also gave a brief overview of the Landsat 7 and Landsat 8 satellites, operated and managed by the United States Geological Survey agency. These satellites, under the Landsat program, were launched primarily to gain new satellite imagery of earth, and the data sourced from them can be viewed in EarthExplorer. The European Union is also a significant provider of geographical data through its Copernicus Programme, which offers data through its Sentinel-1, -2, -3, -4, and Sentinel-5 Precursor satellites. The data can be viewed in the Sentinel Hub website, free of charge, remarked Sahwan. Sahwan said that making use of hundreds of gigabytes of satellite imagery and data, while invaluable for geographers, can be daunting without the proper tools, such as the Google Earth Engine, the Sentinel Hub, and the United States Geological Survey’s ESPA tool.